In Monday night's episode of "Yes, Dear," a peanut allergy sends parents on a hunting expedition for the rogue squirrel who's leaving them in the backyard. Hijinks like these are a staple of actor Mike O'Malley's TV series, "Yes, Dear" in which he plays a regular guy trying to maneuver in a kid-filled house. On a Monday visit to The Early Show, he talks about the series and his personal life. Much like Jimmy Hughes, the character he portrays on "Yes, Dear," O'Malley is a stocky, baseball cap-wearing, regular guy in real life. He's funny, friendly and married. "Yes, Dear" has been a part of CBS' winning Monday night comedy line-up for three seasons. It's sandwiched between "The King Of Queens" and "Everybody Loves Raymond." Critics haven't been kind to the show, but audiences seem to love it. The sitcom looks at two young couples who live together, one in the main house and the other in the guesthouse, and their very different takes on parenting. The show also stars: Lisa Snyder as Christine Hughes (Jimmy's wife), Anthony Clark as Greg Warner and Jean Louisa Kelly as Kim Warner. O'Malley's character is middle class, a nice guy with a big heart, working as a studio security guard. He's had plenty of failed jobs and doesn't like to work very hard at anything. Jimmy and his wife, Christine, live in his brother-in-law's guest house. His brother-in-law, Greg, is a successful businessman, married to Kim, a neurotic, stay-at-home mom. Greg and Kim are an uptight couple who strive to be perfect parents to their young son, Sam. Jimmy and Christine are laid-back, down-to-earth parents raising two young boys, Dominic and Logan. They live in the guesthouse because Christine has gone back to college, so they can't afford a mortgage. The main house is where they hang out. Jimmy is the comic foil to his straight-laced brother-in-law and feels compelled to share his philosophy about being a husband and parent, while still remaining a man's man. O'Malley says, "they also root for each other, which you don't see a lot of on TV because so much of the drama and comedy comes from conflict. But they do enjoy each other." Born in Boston, O'Malley is both an actor and playwright. He attended the University of New Hampshire where he majored in theater. In 1999, he had a self-titled sitcom on NBC. It was based on his own experiences as a regular guy adjusting to adulthood. He wrote, produced and starred in the show, which was cancelled two weeks after it debuted. And you may recognize him for his portrayal of sports fanatic "The Rick" in series of commercial on ESPN. 1991: TV acting debut, bit role as a policeman in an episode of "Law & Order"
1991: Hosted the Nickelodeon game show "Get the Picture"
1992: Served as host of "Nickelodeon GUTS"
1994: Appeared in the Nickelodeon special "The Big Help"
1998: Feature film debut as lead in "Above Freezing." Also appeared as an astronomy teacher in "Deep Impact"
1999: Played an air traffic controller in "Pushing Tin." 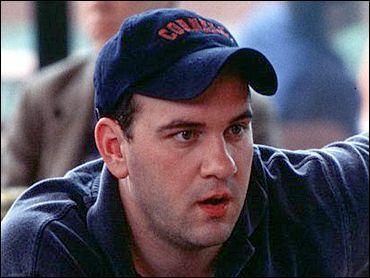 And headlined own short-lived eponymous NBC sitcom "The Mike O'Malley Show"
2000: Had supporting role as a preppy drug addict in "28 Days", starring Sandra Bullock.